Approach: this refers to theories about the nature of language and language learning that serve as the source of practices and principles in language teaching. An approach describes how language is used and how its constituent parts interlock – in other words it offers a model of language competence. An approach describes how people acquire their knowledge of the language and make statements about the conditions which will promote successful language learning. 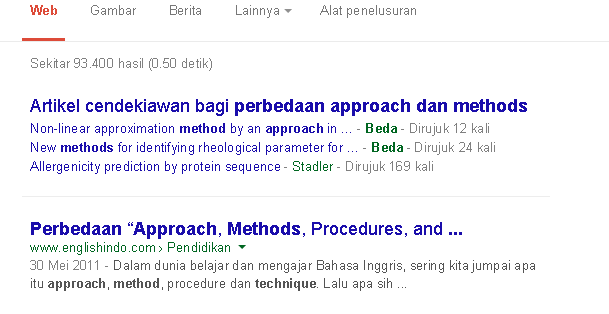 Method: a method is the principal realization of an approach. The originators of a method have arrived at decisions about types of activities, roles of teachers and learners, the kinds of material which will be helpful, and some model of syllabus organization. Methods include various procedures and techniques as part of their standard fare. When methods have fixed procedures, informed by a clearly articulated approach, they are easy to describe. The more all-embracing they become, however, the more difficult it is to categorize them as real methods. Procedure: a procedure is an ordered sequence of techniques. For example, a popular dictation procedure starts when students are put in small groups. Each group then sends one representative to the front of the class to read (and remember) the first line of a poem which has been placed on a desk there. Each student then goes back to their respective group and dictates that line. Each group then sends a second student up to read the second line. The procedure continues until one group has written the whole poem. A procedure is a sequence which can be described in terms such as first you do this, then you do that… smaller than a method it is bigger than a technique. Technique: a common technique when using video material is called ‘silent viewing’. This is where the teacher plays the video with no sound. Silent viewing is a single activity rather than a sequence, and such is a technique rather than a whole procedure. Likewise the ‘finger technique’ is used by some teachers who hold up their hands and give each of their five fingers a word. E.g. he is playing tennis, and then by bringing the is and the not fingers together, show how the verb is contracted into isn’t. Harmer, Jeremy. 2001. The Practice of English Language Teaching. Longman.